Ocean farming could be the next big thing in aquaculture; improving the water, transforming workers from fisheries into restoring our waters and fueling our country, feeding our nation and fighting climate change. “Bren Smith wants to create thousands of decent jobs, transform how we harvest food from the oceans, and blunt the effects of climate change and marine degradation — all at the same time. His big idea: small-scale marine farms. Traditional methods of fishing or aquaculture won’t work under current conditions — we need a 21st-century strategy. Like other oyster farmers, Smith had raised his shellfish in cages on the seafloor. However, Hurricane Irene in 2011 and Hurricane Sandy in 2012 both kicked up massive amounts of marine sediment that smothered 90 percent of his harvest. He realized he had to diversify his farming and raise multiple marine species including seaweeds, for which he knew there was a rising demand. With no experience in sea greens, Smith tapped the expertise of University of Connecticut marine scientist Charles Yarish. Yarish has researched seaweeds for decades and advocates cultivating them for food as well as for ocean remediation. But raising different crops wasn’t enough — Smith had to re-design ocean farming, too. He wondered: What if we could take a vertical approach to aquaculture? He calls his technique “3D ocean farming.” It consists of horizontal ropes on the water’s surface, anchored to hurricane-proof floats, that connect to lines underwater supporting seaweed crops and interspersed with hanging net enclosures to grow scallops and mussels. “Seaweed farming can offset some of the serious problems facing the oceans. Unlike land-based crops, seaweed is what Smith calls “zero-input food” — it requires no additional fresh water, fertilizer, pesticides, feed or soil to grow. It receives everything it needs from the sun and the sea. It grows super-fast — sugar kelp, one of the varieties farmed by Smith, can grow an inch or more a day. Seaweed improves the marine environment by absorbing dissolved nitrogen and phosphorus, two pollutants that wind up in the ocean via agricultural runoff, and carbon dioxide, which drives ocean acidification and global warming. (Oysters are another good nitrogen remover.) Packed with protein, vitamin C and calcium, seaweed is a nutritious addition to human diets. Finally, it can be used as a potent soil fertilizer and as animal feed. A new kind of aquaculture needs a new workforce. In 2013, Smith established the nonprofit organization GreenWave to train new seaweed farmers and provide them with two years of support. (The 3D ocean farming model itself is open-source — anyone can use or build on it for free.) With about $30,000, a boat and a lease (which requires approvals from state regulators and the US Army Corps of Engineers) to farm 20 acres of near-shore seafloor, anyone can start a 3D ocean farm that produces 10 to 30 tons of kelp and 250,000 shellfish per acre in five months, according to Smith. GreenWave also supports research and development of consumer and industrial products derived from seaweed and collaborates with chefs to create appealing kelp dishes. Humans currently consume just a fraction of the 10,000 edible marine plants, points out Smith, so the potential for discovering new crops and flavors is huge. Smith has also set up a parallel for-profit enterprise, which provides a market for seaweed crops and operates a commercial processing and distribution facility in New Haven, Connecticut. It promises to purchase 80 percent of seaweed harvests at triple the market rate from GreenWave farmers during their first five years in business. “Farmers know they can sell what they grow,” Smith says, “and that’s a real incentive to start farms.” Someday, he imagines, we could have a thriving surf-and-turf economy made up of many small seaweed-and-shellfish farms along the coasts that drive land-based employment. Smith’s vision for ocean farming is spreading. So far, GreenWave’s program has resulted in 10 people who are tending seaweed farms, with another 25 in training. In 2015, GreenWave’s 3D ocean farming model won the Buckminster Fuller Institute’s Fuller Challenge, an ecological design prize that recognizes innovative and comprehensive approaches to solving the problems created by marine degradation and climate change. Being on the east coast, this article caught my eye. It makes you wonder about how this simple restorative means of aquaculture could really transform our agriculture. Gertz, Emily. 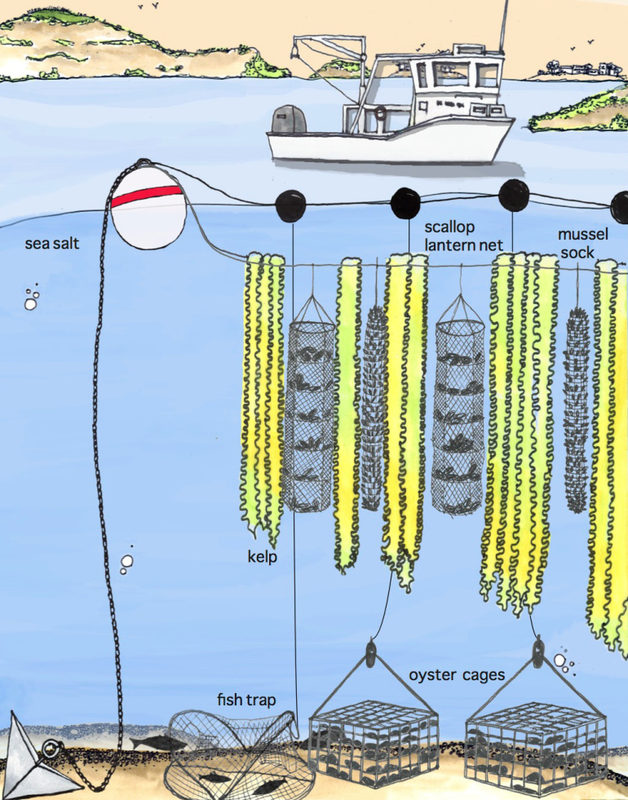 “Vertical Ocean Farms That Can Feed Us and Help Our Seas.” Ideas.ted.com, Ideas.ted.com, 31 July 2017, ideas.ted.com/vertical-ocean-farms-that-can-feed-us-and-help-our-seas/.